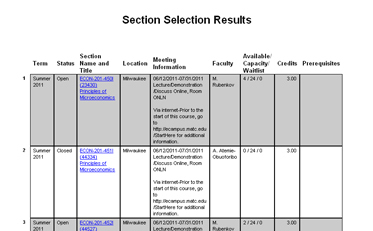 To see the most up-to-date listing of courses offered at MATC, students can visit the INFOnline website. INFOnline is your source for registration, academic records, course schedules, and financial aid information. On the INFOnline home page, click the Search for Classes link. 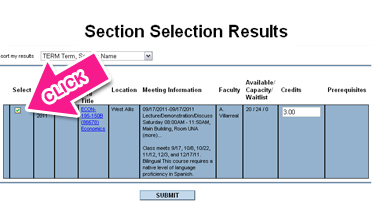 In the Search for Classes form that appears, enter your search criteria to narrow your search. To just search for online courses, be sure the Online Course Search checkbox is checked. When you are done, click the Submit button. After you click the Submit button, your search results will display on the screen. Search results include information about the course as well as its course numbers (course number, section number, synonym), location, instructor, credits, prerequisites, and availability. To register for classes or review one's academic records through INFOnline, students must first be able to log into INFOnline with an INFOnline user ID and password. If you are a new, prospective student that would like to enroll through the online process, please call 414-297-7900 for assistance in setting up an INFOnline account. If you are a current MATC student who is new to using INFOnline for online registration, please go to the INFOnline Website and click the "Getting Started" link on the bottom of the page to retrieve your user ID and establish a password. If you have forgotten your INFOnline user ID or password, please go to the INFOnline Website and use the login help links (ie. "What's My User ID?" and "What's my Password?") at the bottom of the page. Click the Current Students button. 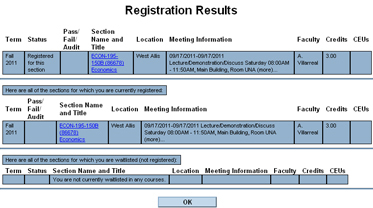 On the Students page that appears, locate the Registration menu and click the Register for Classes link. On the next page, click Search and Register for classes. You will be taken to an MATC payment requirements page. Scroll all the way down to the bottom of this page and click the Search and Register for Classes link. After you click the Submit button, your search results will display on the screen. If you would like to register for an available course, check the Select checkbox associated with the course then click the Submit button. After you click the Submit button, you will be taken to the Register and Drop Sections page. In the Action Menu next to the name of each course you want to register for, select RG-Register. Click Submit when done. After you click the Submit button, you will be taken to the Registration Results page, where you can review or print the list of courses for which you have registered.